In its top 10 workplace problem list, the Houston Chronicle put ‘poor communication’ as among the top issues that most employees complain about. Because of too much focus on the job, some employees forget to talk to each other, making the workplace feel like a cemetery. To break the communication barrier, some people have come up with unique activities. One of which is buzzword bingo. Buzzword bingo, as the name implies, follows the format of the classic game. However, when it comes to the materials used, buzzword bingo is different. If cards at FoxyBingo.com don numbers from 1 to 75, cards used in the game are printed with different words. In addition to that, the game does not have a bingo caller. In order to win, participants need to tick off the words in their cards that match the ones that their officemates have spoken. The game’s prizes vary depending on what the participants have agreed upon. The game is definitely fun as it has been used by people from different sectors. Even the British labour delegates played it while listening to Prime Minister Tony Blair’s speech. The only setback in this game is that there is a tendency that some words will be overused. If you want to improve the game’s high replay value, what you can do is get tips and strategies from the Buzzword Bingo Book. This how-to humour book, which was written by Lara Stein and Benjamin Yoskovitz, is especially created to prevent usual buzzword bingo games from becoming a yawn-athon. It provides a complete guide to the game, an overview of strategies, and comic ways of explaining why some managers insist on using buzzwords. The Buzzword Bingo Book also has 500 definitions of buzzy terms and 50 ready-to-use cards. After reading this book, employees will have more fun ways of playing buzzword bingo in the office. 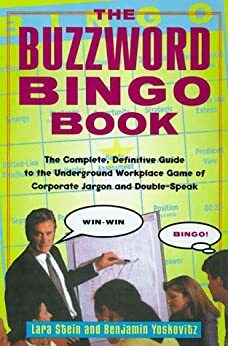 For Yoskovitz The Buzzword Bingo Book is the best book to have in offices. If officemates want to create a bond among each other, the book will be of great help. However, employees must yell BINGO! at their own risks to prevent a scolding from their terror boss.